Yes…it’s been a while, but I have had other things going on. There just isn’t enough time in the day to do it all! But, never fear! I have no plans to stop blogging, I just can’t guarantee how often I will be doing it. I wanted to spend this post giving you all a brief primer on the postcards that can be found at the WonderGround Gallery located in Downtown Disney in Anaheim, California. I do not profess to be an expert on these cards, but I do believe I possess a high percentage of the cards that have been sold there. WonderGround opened it’s doors a few years ago (I don’t know the exact date) and is a Disney owned property. It features the art of various Disney artists and sells there work in various formats…from postcards all the way up to large limited edition giclée canvases. I personally have 53 unique WonderGorund Gallery postcards. I suspect that there are at least 10-20 more…and possibly quite a few more. That said…when I look at all the WonderGround cards for sale on eBay…I have almost all of them. So…I am guessing there are not more than 60-70 total cards as of this writing. have are the cards I bought most recently. This suggests that there is some semblance of ascending order in the card numbering…but the numbering scheme itself seems rather random. The earliest card I have is numbered 00006 84312 (“Hipster Mickey” by Jerrod Maruyama). I bought this sometime in late 2012 or early 2013. 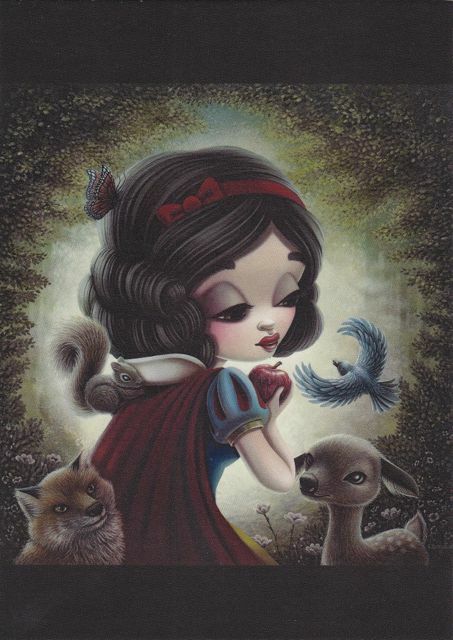 The most recent card I have is 00008 66709 (“The Fairest One of All” by Shannon Bonatakis). I purchased this card sometime in May, 2014. The two earliest cards in my collection a have slightly different back than all the rest. 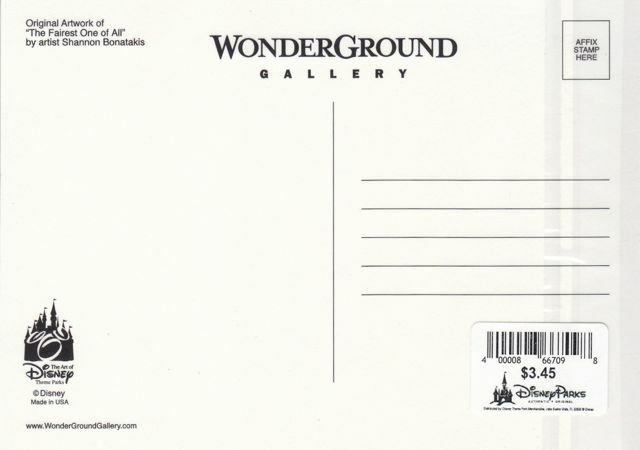 The banner on the top back says “WonderGround – An Uncommon Gallery”. 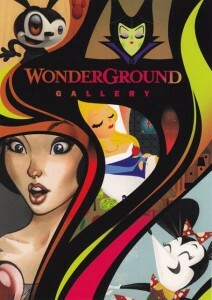 All the other cards say “WonderGround Gallery”. Up until about two months ago (April, 2014), the cards cost $2.95 each. Like many things at Disneyland though, the price has gone up. The cards now cost $3.45 each. So there you have it. 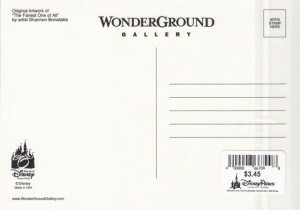 A brief primer on the WonderGround Gallery and it’s postcards. I will continue to occasionally feature these cards on the blog as these are the only new cards coming out on a regular basis at the park. New postcards of the park proper are rare. Facebook, Instagram and all the rest have taken their toll on the postcard as a form of communication! 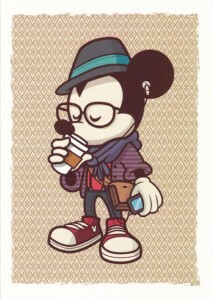 This entry was posted in Disney Postcards, Disneyland, Disneyland Postcards, WonderGround and tagged WonderGround. Bookmark the permalink.